Port Stephens Council is facing increased pressure to provide enhanced services and facilities to meet the high standards our community expects, and to continue to invest in our local area. While Council has implemented a range of productivity savings, reduced costs and been assessed as financially sustainable by the NSW Government, there are parts of our local government area, which require significant work. 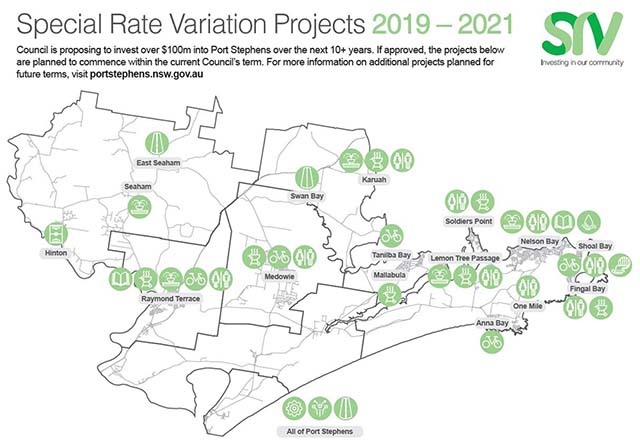 To achieve this, Council has applied to the Independent Pricing and Regulatory Tribunal (IPART) for a rate increase, known as a Special Rate Variation (SRV) in 2019. Click on the map above to view full details. For more information on projects scheduled for future terms, visit the ‘Projects’ section on the right of this page.